With a blend of business, recreation, banquet and leisure services, this Tucson hotel offers all-inclusive amenities in a beautifully landscaped Sonoran Desert setting. 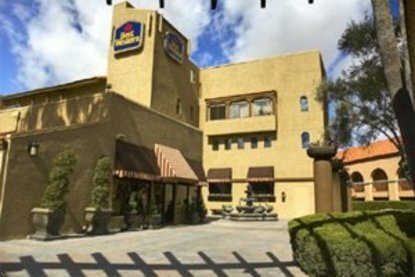 The Best Western Las Brisas Hotel- Tucson Airport provides comfortable accommodations for business and leisure travelers to the area. This Tucson hotel is just a short 10 minute drive to The University of Arizona. Hotel guests can drive south on Interstate 19 to Green Valley and then on to Nogales, Mexico for a day of shopping. Also nearby are Tombstone, Bisbee and Kartchner Caverns, one of the top 10 wet caverns in the world. Each spacious, well-appointed room is fully equipped with complimentary high-speed Internet access, cable satellite television, ample desk space, refrigerator, coffee/tea maker and iron/ironing board. Every morning guests to this Tucson hotel are greeted with a complimentary full breakfast. After a busy day, visitors to this hotel can enjoy a dip in the outdoor pool and spa or a workout at the on-site fitness center. Additional amenities include a tennis court, sand volleyball court, putting green and horseshoe pit. Business guests will appreciate the on-site business center and 24-hour complimentary airport shuttle. For a sunny retreat and friendly service, visit the Best Western Las Brisas Hotel- Tucson Airport in Tucson, Arizona.